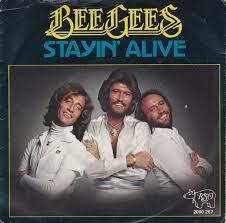 ‘Stayin’ Alive’ by The Bee Gees became the 15th song to clock up 7 or more weeks at 1 as it held on to the top spot while their ‘Night Fever’ moved up from 3 to 2 which meant that The Bee Gees became the only act who would hold the top 2 positions with 2 different pairings. Earlier in ‘Stayin’ Alive’s run at 1, we had seen ‘How Deep Is Your Love’ at 2. Uriah Heep’s ‘Lady In Black’ picked up a second biggest climber as it moved up 5 from 13 to 8 to take the award. Of all the songs about women in black (the other 2 being The Hollies ‘Long Cool Woman In A Black Dress’ and Mungo Jerry’s ‘Long Legged Woman Dressed In Black’), this was the only one that would manage a second biggest climber award. Suzi Quatro’s ‘If You Can’t Give Me Love’ and Barry Manilow’s ‘Can’t Smile Without You’ were both star raters, climbing 4 places to land at 7 and 13 respectively. This would be the only time we would see 2 star raters in the same week with the word ‘can’t’ in the title. While The Bee Gees were enjoying holding the top 2 positions again, it was not all good news for them as ‘How Deep Is Your Love’ was one of the 2 biggest fallers as it dropped 5 from 6 to 11 to give them their 13th time with the award. They were now tied with The Sweet for the most biggest faller awards. The other song dropping 5 places was Wings’ ‘Mull Of Kintyre’ which fell from 12 to 17. This was their 7th time with the award. It was also the 7th song to manage 11 weeks as the oldest on the charts. It had been with us for 23 weeks. The last song to reach that many weeks was Kenny Rogers’ ‘Lucille’ which did so back in the December of 1977. There were 3 songs that left the charts. The first of these was Clive Risko’s ‘Bluest Heartache Of The Year’ which had managed a run of 8 weeks and a peak of 16. This was the mirror opposite of his previous hit, ‘Face Of An Angel’ which managed 16 weeks and a peak of 8. This ended the SA chart run for Risko and he was now the 2nd act to have 2 hits which had mirror weeks and peak figures (Dickey Lee the other one to manage this). Carl Douglas also saw his SA chart hit career come to an end as ‘Run Back’ left the top 20 after a run of 14 weeks and a peak of 5. He had managed 3 hits, spent a total of 36 weeks in the charts and enjoyed 7 weeks at 1 with ‘Kung Fu Fighting’ his best peak. Like ‘Run Back’, Neil Diamond’s ‘Desirée’ managed 14 weeks but peaked 1 place higher, going to number 4. This was Diamonds 5th hit of his 11 to date to make the top 5. He still had a few more hits in him. Boney M returned to the charts for their 3rd outing, this time with a cover of a 1970 reggae tune, ‘Rivers Of Babylon’, which was based on Psalms 19 and 137. The original was recorded by The Melodians which, after initially being banned, went on to get to number 1 in Jamaica. That version appeared on the soundtrack to the 1972 film ‘The Harder They Come’ which starred Jimmy Cliff. Boney M’s version would be the 15th song by a Jamaican act to make our top 20 and it would top the charts in Australia, Austria, Belgium, France, Germany, Ireland, Holland, New Zealand, Norway, Sweden Switzerland and the UK (at least 12 countries). It would even give them their highest ever peak on the US charts where it managed to get to number 30. Jamaica now sat tied with Ireland for number of hits by acts from a nation. (Note: I have chosen to classify Boney M as Jamaican, although there is also a compelling case to regard them as German). The second new entry was also a cover version. This one was local group Copperfield’s take on the Hot Chocolate hit from 1977, ‘So You Win Again’. The song was written by singer song writer Russ Ballad and Hot Chocolate’s version would top the UK charts for 3 weeks as well as going to 31 in the US. Apart from Copperfield’s cover, there was another South African connection as Mickie Most was the producer on the Hot Chocolate version. Most was an Englishman who started his musical career in South Africa with his band Mickie Most & His Playboys. This was Copperfield’s second SA hit which followed up 1975’s ‘Rock ‘n’ Roll Singer’ to be the 16th biggest gap to date between hits by a local act being 147 weeks since they were last on the charts. Their version would also chart in neighbouring Zimbabwe, going to number 8 there while Hot Chocolate’s version would not chart in either country. On a literary note, we had Copperfield and Uriah Heep in the same chart. For those who don’t get it, Uriah Heep was a character in Charles Dickens novel ‘David Copperfield’. Our final new entry was, like the other 2, a cover version, and like Copperfield’s one, was by a local act. Gene Rockwell’s ‘Rosie’ which entered the charts at 20 this week was a cover of a song by US country singer, Sonny Throckmorton. Throckmorton’s version would reach number 76 on the US Country Singles charts. This was Rockwell’s 9th song to chart. Rockwell was the 21st act to reach 9 hits and the 4th local act to do so. There had been a gap of 102 weeks since he was last on the chart. Rockwell, who held the record to date for a gap between hits by a local act, joined Judy Page and Lance James as the only local acts to have had a gap of 100 weeks or more between hits twice. The Bee Gees saw their weeks total move past the 160 mark and with 3 hits in the charts it jumped from 159 to 162. They were in second place over all and just 23 behind overall leader Tom Jones. Wings celebrated reaching 60 weeks in the charts which was by far the best to date by a post-Beatles Beatle. Paul McCartney had accumulated a further 24 weeks as a solo artist giving him a total of 84. John Lennon was the next best on 46 with Ringo on 45 and George way behind on 24. Smokie, meanwhile celebrated passing the 800 points mark and they sat 29th overall. Gene Rockwell’s new one moved him into tied 11th place on the local weeks count list, equalling Maria’s 55.